A device for carrying out microfluidic reactions comprises a reaction chamber (30), a fluid duct communicating (10) with said reaction chamber (10) including a hydrophobic region (20) and a pressure control element (50) for applying a predetermined pressure toliquid in the duct (10) in response to a suitable signal. The duct and reaction chamber are provided on a silicon microchip, whilst the pressure contrl element (50) is provided externally. This invention relates to the control of liquids in microfluidic reaction devices, particularly, although note exclusively, in devices which are monolithically formed from silicon or the like. Although microfluidic reaction devices are known, the type of reactions which may be carried out on them are relatively limited and, for example, they are not particularly suited to reactions where the timing of the reaction or the timing of the addition of reagents is critical . It is an aim of the present invention to provide a microfluidic reaction device which can facilitate a greater range of reactions than is presently possible. When viewed from a first aspect, the present invention provides a device for carrying out microfluidic reactions comprising a reaction chamber, a fluid duct communicating with said reaction chamber including a hydrophobia region and a pressure control element for applying a predetermined pressure to liquid in the duct in response to a suitable signal. Thus, it will be appreciated by those skilled in the art that in accordance with the present invention the flow of liquid to the reaction chamber may be controlled by a pressure control element co-operating with a hydrophobic region. This allows precise control of the timed addition of a liquid reagent to the reaction chamber. The pressure control element may be any suitable pneumatic or hydraulic control element and may be located upstream or downstream of the reaction chamber. If it is upstream of the reaction chamber, it may be before or after the hydrophobic region. It should be understood by those skilled in the art that the hydrophobicity of a particular portion of a duct , i.e. the degree to which it may be wetted by a liquid, will be influenced both by any geometrical features of the surface, such as step changes in cross- sectional area as well as the inherent hydrophobicity of the surface material i.e. its fluid contact angle. As used herein, the term "hydrophobic region" should be understood as referring to a region which is more hydrophobic i.e. which results in a lower internal pressure in a liquid in that specific region, than the combination of the surface material and geometry upstream of the hydrophobic region. In other words, no absolute degree of hydrophobicity may be "inferred from this expression. The reaction chamber may be supplied by just one duct - e.g. the reagents may be passed serially along the duct. Alternatively, the device may comprise a plurality of ducts connected to the reaction chamber. This allows reagents to be supplied from separate ducts. Most preferably a single pressure control element controls the pressure in all of the ducts supplying the reaction chamber. This has clear benefits for economy of manufacture and minimises the space on the substrate required by the device . It may be that none or only some of the additional ducts comprise a hydrophobic region - for example ducts intended to supply a first set of reagents may not require a hydrophobic region, whilst the duct or ducts supplying a second set of reagents or another liquid such as water for washing may be supplied by ducts comprising a hydrophobic region. Preferably, however, each of the plurality of ducts comprises a hydrophobic region. Most preferably, the hydrophobic regions have different degrees of hydrophobicity. In other words, different pressures are required for a liquid to breach them. This allows full flexibility in controlling not only the order, but also the timing of each reagent's addition. As the pressure applied by the pressure control element is steadily increased, the hydrophobic regions in the ducts will be breached in order of their breach pressures. Of course, by knowing what these breach pressures are, the pressure control element may increase the pressure in steps at the required times in order to deliver reagents at precisely controlled times. The reaction chamber could theoretically be closed in that the products of the reaction remain therein once the reaction has been completed. Preferably and more practically however, an outlet duct is provided to convey the reaction products away from the reaction chamber. Preferably the outlet duct is also provided with a hydrophobic region. This is beneficial in that it allows the reagents to be confined to the reaction chamber whilst the reaction is happening and it also helps to prevent cross-contamination both through unwanted leakage of the reagents from the reaction chamber into other parts of the device, and also leakage into the reaction chamber from other parts of the device. Again, it is preferred that a single pressure control element is provided, preferably downstream of the hydrophobic region in the outlet duct. In this case, the breach pressure of the outlet hydrophobic region must be higher than that of the inlet hydrophobic region or at least one of the inlet hydrophobic regions. The reaction chamber preferably comprises immobilisation means for immobilising particles once they have entered the reaction chamber. Examples of suitable immobilisation means comprise a filter, preferably of the type which extends around the flow axis as disclosed in WO 01/85341; a magnetic field, for immobilising magnetic beads and the like; or a surface material modification suitable for immobilising a particular type of particle. Preferably the hydrophobic region or at least one of the hydrophobic regions is/are provided with a vent channel as disclosed in SE 0004350-5. It will be appreciated by those skilled in the art that many combinations of the structures described above may be provided in a single device and/or controlled by a single pressure control element depending upon the particular reactions which it is desired to carry out. For example, multiple reaction chambers could be provided with a single pressure control element and could have different outlet hydrophobic regions in order that the products thereof may be staggered in their conveyance to a next stage. The principles set out above are applicable in many circumstances, but are of particular benefit when used in the context of a microfluidic device formed on a silicon 'chip' - e.g by deep reactive ion etching. Thus in a particularly preferred embodiment, at least the duct and the reaction chamber are formed on a microchip or the like. This allows the overall size of the device to be very small and therefore, preferably, portable. It also allows dense arrays of similar devices to be formed on a single chip - e.g. to carry out large numbers of parallel operations. Such a microchip could be provided with a suitable pressure control element to apply the required pressures to the liquid, or such could be provided externally of and be adapted to interface with the chip. Figures 10a to lOe show schematically the operation of yet another embodiment of the invention. Turning firstly to Figure la, there may be seen schematically an inlet duct comprising a fluid channel 10 serving a downstream reaction chamber 30. The fluid channel 10 has a hydrophobic region 20 in the form of a patch of octafluorocyclobutane (C4F8) . The reaction chamber 30 has an outlet 40 which is in turn connected to a pressure control element 50. In a practical example, the duct and reaction chamber may be formed on a chip micro-machined from silicon using a Deep Reactive Ion Etching (DRIE) process. The pressure control element is provided by a macro device external to the chip . In operation of the embodiment shown in Figure la, fluid may be introduced to the end of the inlet channel 10 by pressure generated by the pressure control element 50. At first, however, the pressure is not sufficient for the liquid to pass the hydrophobic patch 20 and it will therefore not travel beyond the edge of the hydrophobic patch. When the pressure is increased beyond the threshold pressure of the hydrophobic patch 20, the fluid in the inlet channel may flow past the hydrophobic patch and into the reaction chamber 30. In this embodiment, the liquid may thereafter flow freely out of the reaction chamber 30 by means of the outlet 40 and this arrangement is therefore suitable for through-flow reactions. It will be appreciated however that by judicious control of the pressure exerted by the pressure control element 50, the start of the reaction may be precisely controlled. Figure lb shows an embodiment which is similar to that in Figure la except that the pressure control element 50 is located upstream of the reaction chamber 30 and the hydrophobic patch 20. A further embodiment of the invention is shown in Figure 2a. In this embodiment, the reaction chamber 30 is provided with two inlet channels 10, each^of which has a hydrophobic patch 20. Thus, in this embodiment, when the appropriate threshold pressure is applied by the pressure control element 50, liquid applied to both of the inlet channels 10 will enter the reaction chamber 30 simultaneously. Figure 2b shows an extension of the arrangement shown in Figure 2a whereby many inlet channels 10, each of which have a hydrophobic patch 20, feed a common reaction chamber 30. In common with the embodiment of Figure 2a, only a single pressure control element 50 is required to control flow of liquid in the inlets 10 into the reaction chamber 30. Figure 3a shows one way in which the embodiments of Figures la and 2a may be combined into a larger system. It will be seen that in this arrangement, several reaction chambers 30 are provided (three of which 30a, 30b, 30c are shown) . It will be seen that two of the reaction chambers 30a, 30c are supplied by one inlet channel 10 each, whilst the other reaction chamber shown 30b is supplied by two inlet channels 10. All of the inlet channels are provided with hydrophobic patches. Furthermore, the outlet channels 42 for the chambers combine into a single outlet channel 44 in which the pressure control element 50 is provided. Thus with a single pressure control element 50, liquid may be drawn into the reaction chambers 30a, 30b, 30c simultaneously, which may be two different liquids in the case of the reaction chamber 30b, and then conveyed via the common outlet channel 44 to a waste chamber or the like. Figure 3b shows an embodiment similar to that in Figure 3a except that hydrophobic patches 24 are additionally provided in the individual outlet channels 42. These have a higher threshold pressure than the inlet hydrophobic regions 22 in order that an intermediate pressure may be applied by the pressure control element 50 in order to fill the reaction chambers 30 whilst confining the reagents to the reaction chambers; and thereafter a higher pressure may be applied in order to empty the reaction chambers 30 by means of the common outlet 44. The outlet hydrophobic patches 24 allow the reagents to be confined in the reaction chambers 30 whilst the reactions take place and also prevent the reagents from cross-contamination. Figures 4a and 4b respectively show schematically further embodiments of the invention. In these embodiments, three reaction chambers 30 are placed in series with one another. 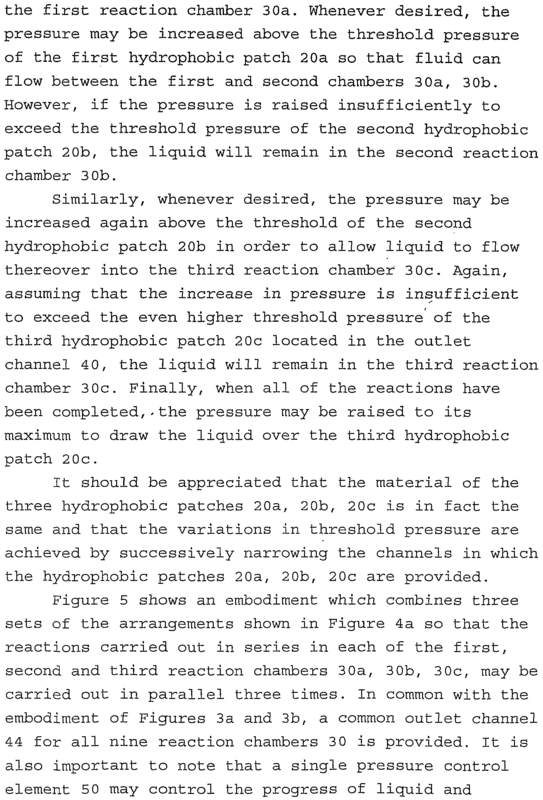 No hydrophobic patch is provided in the inlet 10a to the first reaction chamber 30a, but hydrophobic patches 20a, 20b, are provided downstream of the first, second and third reaction chambers 30a, 30b, 30c respectively. The threshold pressures of the three hydrophobic patches 20a, 20b, 20c increase progressively from one to the next. In the embodiment of Figure 4a, a common pressure control element 50 is provided downstream of the three reaction chambers 30a, 30b, 30c, whilst in the embodiment of Figure 4b, it is provided upstream of the three chambers, 30a, 30b, 30c. which are similar to Figures la and lb except that, in each case, instead of just a hydrophobic patch 22 provided in the inlet channel 10, another hydrophobic patch 24, of greater threshold pressure, is provided in the outlet channel 40. As has been discussed above, the difference in threshold pressures is achieved by means of the diameter of the channel in which the hydrophobic patch 22, 24 is provided. This embodiment shows how liquid may be confined in the reaction chamber 30 while a reaction is taking place and also to prevent cross- contamination . Figures 7a to 7c show respectively embodiments similar to that of Figure la but with the addition of a different type of particle immobilisation means in each case. In the case of Figure 7a, a filter 70 is shown schematically. As will be seen by the dotted line, this is of the type which extends around the flow axis of liquid entering the reaction chamber 30. Further details of this arrangement are given in WO 01/85341. In Figure 7b, the immobilisation means is a specific substance or surface material 80 that is provided inside the reaction chamber 30 during fabrication and is thus not removed during loading of specific liquids in the reaction chamber. An example of one possible surface treatment is given in H. Andersson, "Patterned Self-Assembly Beads in Silicon Channels" Electrophoresis 2001, 22, pp 3876- 3882. Figure 7c shows the possibility of providing a magnetic field 90 within the reaction chamber 30 in order to immobilise magnetic beads. Figure 8 shows schematically the provision of a vent channel 100 in gaseous communication with a hydrophobic region 20. This could be applied to the hydrophobic regions of any of the embodiments described herein. Figures 9a to 9b show schematically the operation of a further embodiment of the invention. In this embodiment, three reaction chambers 30c, 30d, 30e are provided, each of which has a different means for immobilising particles. Thus, the uppermost reaction chamber 30c has a special surface material 80. the centre chamber 30d has a filter 70 and the lowermost chamber 30e has a magnetic field 90 provided by external magnets . Each reaction chamber 30c to 30e also has different inlet channels. The uppermost chamber 30c has two identical inlet channels 10a, each provided with identical hydrophobic regions 22. The centre chamber 30d has two inlet channels 10b, 10c with one being narrower than the other. Again each has a hydrophobic region 23,28, although the hydrophobic region 28 in the narrower channel 10c will have a higher threshold pressure by virtue of the smaller bore . The third reaction chamber 30e is also narrow and thus has a high threshold pressure hydrophobic region 29. As in previous embodiments, a single pressure control element 50 controls fluid flows throughout the device . In use, liquid samples are applied to the inlet channels 10a - lOd and suction pressure applied by the pressure control element 50 as shown in Fig. 9a. After a period of time, the liquid in each of the inlets 10a - lOd reaches its respective hydrophobic patch 22,23,28,29 as shown in Fig. 9b. A greater pressure is then applied by the pressure control element 50 which is between the respective threshold pressures of the wide hydrophobic regions, 22,23 and the narrow ones 28,29 so that liquid breaches the wider hydrophobic regions 22,23 only. Thus, both liquids will enter the upper reaction chamber 30c, one of the liquids will enter the centre reaction chamber 30d and no liquid will enter the lower reaction chamber 30e. This is shown in Fig. 9c. A reaction may therefore commence on the upper chamber 30c. After the application of an even greater pressure by the control element 50, liquid will breach the remaining hydrophobic regions 28,29 and thus enter the reaction chambers 30d,30e. By this stage, the original liquid will be drawn into the common outlet channel 44. This is shown in Fig. 9d. Figs. 10a to lOe show a method of using a further embodiment which is a modification of the embodiment in Figs. 9a to 9d. The embodiment depicted is the same as the previous one, except that the outlet channels 42c,42d,42e are also provided with hydrophobic regions 26c,26d,26e. Specifically the upper and lower hydrophobic regions 26c, 26e are the same width and narrower than the central one 26e. The threshold pressure of the narrower regions 26c, 26e is greater than all of the inlet hydrophobic regions 22,23,28,29. The wider outlet hydrophobic region 26d has the same threshold pressure as the narrower inlet hydrophobic regions 28,29. Figs. 10a and 10b depict exactly the same operation as Figs. 9a and 9b. Similarly, when an intermediate suction pressure is applied by the pressure control element 50, as shown in Fig. 10c, liquid will breach the wider inlet hydrophobic regions 22,23 as was shown in Fig. 9c. However, as Fig. 10c shows, the outlet hydrophobic regions 26c, 26d prevent the liquids reaching the common outlet channel 44. As in Fig. 9d, Fig. lOd shows the application of a higher pressure causing liquid to breach the remaining inlet hydrophobic regions 28,29 and enter the reaction chambers 30d,30e. However, in this embodiment, the higher pressure also causes liquid from the centre reaction chamber 30d to breach its outlet hydrophobic region 26d and therefore enter the common outlet channel 44. The liquids in the upper and lower reaction chambers 30c, 30e however remains confined which allows reactions therein to continue and prevents cross- contamination . Finally maximum pressure is applied in Fig. lOe. This causes liquid in the upper and lower reaction chambers 30c, 30e to breach the remaining outlet hydrophobic regions 26c, 26e and thereby enter the common outlet channel 44. It will be seen therefore that by controlling the pressure of a single pressure control element, only the liquid in a predetermined number of channels will enter the reaction chambers. By appropriate timing of the pressure control, it can be arranged that different liquid samples enter the reaction chambers at different times. In other words, it is possible to control the entry of fluid to specific reaction chambers in a parallel system with only one pressure control element.. Furthermore, the method may be repeated a number of times in order to time-control a series of subsequent reactions in the same reaction chambers. Thus, in accordance with at least the preferred embodiments of the invention, complex series of reactions are possible, with precise timing of liquid reagent flow. As has been shown, with appropriate design of the channels and hydrophobic regions, this may be achieved with a single pressure control element . It will be appreciated that the particular arrangements shown are merely exemplary and many different designs are possible using the basic principles of the invention, depending upon the reaction (s) which it is desired to carry out. 12c. A thick photoresist layer 100 (Shipley SJR 1813) layer was applied and spun at 200rpm for 20 seconds and 500rpm for 40 seconds. Openings 102 were patterned in the photoresist 100, with an overlap of 5 microns on either side of the channel 10, as seen in Fig. 12b. C4F8 was then deposited in the ICP for 4 minutes at 20°C. The resist 100 was stripped in acetone, followed by rinsing in 2-propanol and water. The last photoresist residues were stripped in 02 plasma for 30 minutes. A hydrophobic patch 200 microns long was left. The etched and CF8 treated wafers were then bonded to Pyrex 104 in order to seal the device, Fig 12c. A low temperature bonding technique was used with a 1 micron thick spin-coated benzocyclobutene on the Pyrex wafer 104 as the intermediate bonding material. A bonding pressure of 0.5 bar and curing temperature of 210°C were used for 60 minutes. In- and outlets were then DRIE on the back side of the silicon wafer using a standard photoresist mask. The silicon-glass stack was sawn into 11x11 mm2 chips and a fluid connector glued to the outlet 44. A water column pressure of 760 Pa was needed for water to run over one hydrophobic patch 20. The C4F8 film resisted water for at least 5 hours. It also resisted acetone, propanol, bead solution, and reagent mixture used in the PYROSEQUENCING (TM) sequencing-by-synthesis reaction for at least 20 consecutive times. The hydrophobic valve also resists very high concentrations (25%) of surfactants (Tween 80) . 1. A device for carrying out microfluidic reactions comprising a reaction chamber, a fluid duct communicating with said reaction chamber including a hydrophobic region and a pressure control element for applying a predetermined pressure to liquid in the duct in response to a suitable signal . 2. A device as claimed in claim 1 comprising a plurality of ducts connected to said reaction chamber. 3. A device as claimed in claim 2 comprising a single pressure control element controls the pressure in all of the ducts supplying said reaction chamber. 4. A device as claimed in claim 2 or 3 wherein each of the plurality of ducts comprises a hydrophobic region. 5. A device as claimed in claim 4 wherein the hydrophobic regions have different degrees of hydrophobicity . 6. A device as claimed in any preceding claim comprising an outlet duct for conveying reaction products away from the reaction chamber. 7. A device as claimed in claim 6 wherein said outlet duct is provided with a hydrophobic region. 8. A device as claimed in any preceding claim wherein said reaction chamber comprises immobilisation means for immobilising particles once they have entered the reaction chamber. 9. A device as claimed in claim 8 wherein said immobilisation means comprises a filter. 10. A device as claimed in claim 8 wherein said immobilisation means comprises a magnetic field. 11. A device as claimed in claim 8 wherein said immobilisation means comprises a surface material modification suitable for immobilising a particular type of particle. 12. A device as claimed in any preceding claim wherein the hydrophobic region or at least one of the hydrophobic regions is/are provided with a vent channel. 13. A device as claimed in any preceding claim comprising a plurality of reaction chambers, each communicating with at least one duct having a hydrophobic region wherein a single pressure control element is provided to control the poressure in all of said ducts . 14. A device as claimed in any preceding claim comprising a plurality of reaction chambers, each having an inlet duct and an outlet duct including hydrophobic regions, wherein the hydrophobic region of each outlet duct has a greater threshold pressure than that of the corresponding inlet duct, said device further comprising a single pressure control element for controlling the pressure in all of said inlet and outlet ducts. 15. A device as claimed in any preceding claim wherein the duct and the reaction chamber are formed on a microchip or the like. 16. A device as claimed in claim 14 wherein said pressure control element is located externally of said microchip .